There are countless sandwich archetypes. The ham & cheese, the turkey pesto, the Italian, the French Dip, the Reuben, the Club Sandwich, the BLT. One of the things I enjoy about sandwiches is how many different types there are, and the variety that people find within the limits each form presents. But I also enjoy those limits for their own sake; I am something of a traditionalist and I prefer when someone makes a sandwich that exists comfortably within the form of what I understand a particular sandwich to be. What I enjoy about this is that everyone who’s making that sandwich is essentially attempting the same task. They might go about it in different ways or with different tools, but everyone’s aiming for the same mark. It allows for a kind of 1-to-1 comparison that isn’t possible in a lot of criticism. In this case, we have the classic thanksgiving sandwich, previously seen here. The root of the form, of course, is thanksgiving leftovers. 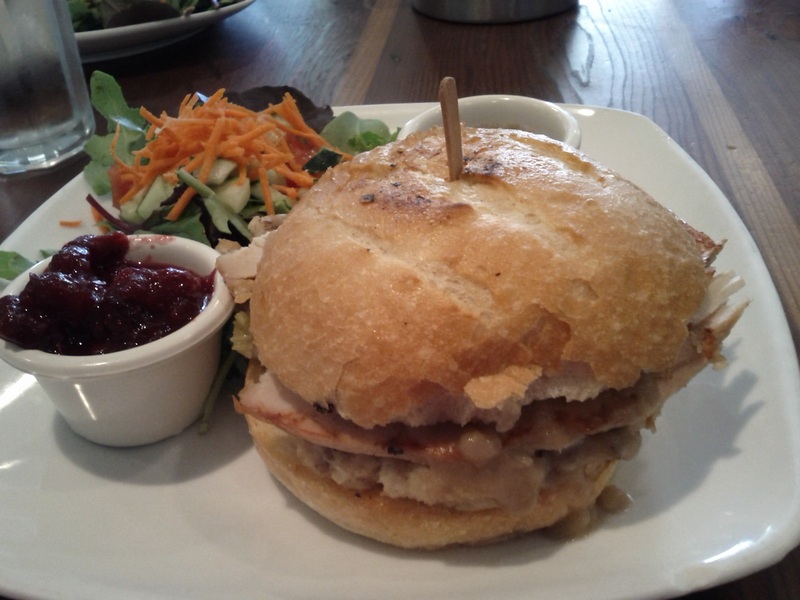 Roast turkey, stuffing, gravy, and cranberry sauce seem to be the standard requirements, and that seems to be a fine base, as I don’t know if I’ve ever consumed a thanksgiving sandwich that didn’t leave me satisfied. It is the rare sort of sandwich that has both a very high ceiling and a fairly high floor; it can certainly excel but the average example isn’t so bad. The example at Village Bakery, thankfully, tended more towards the excellent half of that scale. The cranberry sauce was particularly choice, well spiced and full of cranberries, served on the side so you could pile on as much or as little as you wanted. The stuffing had been crisped up in a skillet or on a griddle, something that doesn’t make a huge difference but is certainly a welcome touch. The roast turkey was juicy, and the gravy was tasty and not excessive. The only complaint I have concerns the roll, which associates tell me can vary quite a bit depending on what’s being baked or who’s doing the baking. The taste was fine, but the exterior was just too tough. Toasting it might have crisped things up, but as it stood it took some effort to tear off a bite. That didn’t cause a catastrophic level of filling creep, but there was plenty of sliding going on. Thankfully, though, the sandwich was delicious and well worth the effort to corral things. This entry was posted in Sandwich Reviews and tagged Los Angeles, Reviews by Pete, Sandwiches I Have Eaten, Sandwiches Made For Me, Thanksgiving Sandwich by Pete. Bookmark the permalink. One LA’s best sandwiches, for sure. Spot on on the gravy ratio, it’s never overpowering. I think that was what led to the less-than-expected level of filling creep. Too much mayo or gravy or similar in any sandwich is likely to exacerbate any slippage, and luckily that was avoided here.